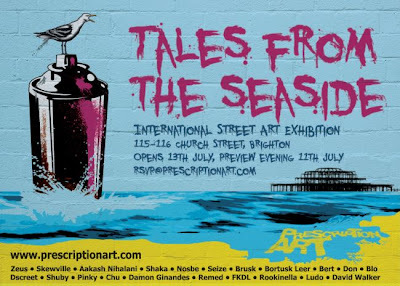 Brighton will be the location for Prescription Arts next exhibtion "Tales From The Seaside. This forthcoming exhibition will feature a selection of International Street Artists exhibiting in what has been described as beautiful 6500 square foot space in the centre of Brighton. Set to open on the 11th July with a preview evening, the show will run for three weeks. Some of the Artists include Zeus, Skewville, Askashi Nihalani, Pinky, Dscreet, Chu, Bortusk Leer Bert, and Remed to name a few. Fantastic exhibiton, I would encourage anyone in Brighton just to go have a look.